Le Bernardin chef Eric Ripert is a master at weaving together unexpected ingredients, like this tender cooked octopus with a sauce of salty fermented black beans and sweet pear. Finding a wine pairing for such a complex dish, however, is a challenge. “It needs a very aromatic wine, just to stand up to all the flavors,” says wine director Aldo Sohm. I used a fresh baby octopus that was available at the Asian Market in my local area. Cooking the octopus by this method ensure a very tender protein. Given the amount of salt in the various components of this dish, I omitted the squid ink. I also added a pinch of brown sugar just give a little more sweetness to the dish and to balance out the acidity of the lemon juice and the balsamic vinegar. In a large, deep skillet, combine 2 quarts of water with the onion, garlic, parsley, prosciutto and salt. Cover, bring to a boil and simmer over moderate heat for 5 minutes. Add the octopus to the broth, cover partially and simmer over low heat until tender, about 1 hour; drain and pat dry. In a small skillet, heat the vegetable oil. Add the black beans and cook over moderate heat for 2 minutes. Add the garlic, ginger and shallot and cook until softened, about 4 minutes. Add the red bell pepper and jalapeño and cook until starting to soften, about 2 minutes. Stir in the pear and remove from the heat. Stir in the lemon juice and chives. In a small bowl, whisk the miso with the balsamic vinegar, oil, squid ink and 2 tablespoons of water. Season with salt and pepper. 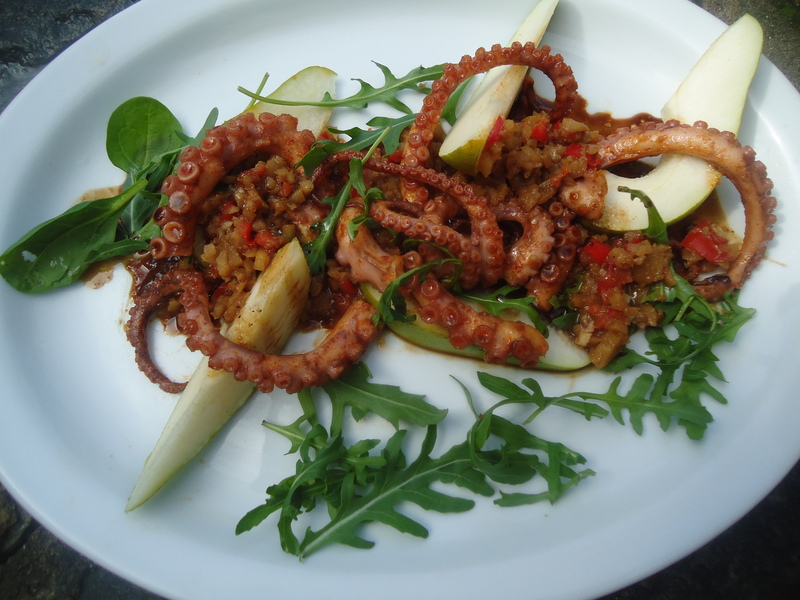 In a bowl, mix the olive oil with the paprika and rub it all over the cooked octopus; season with salt. In a skillet, heat the vegetable oil until shimmering. Add the octopus and cook over high heat until browned all over, about 6 minutes. Transfer the octopus to a carving board and slice it crosswise 1/3 inch thick. Spread the vinaigrette on 4 plates and top with the octopus. Spoon the black bean–pear sauce over the octopus. Garnish with the arugula and pear wedges and serve. This entry was posted in Main Dishes, Salads, Seafood and tagged Arugula, Black Beans, Miso, Octopus, Pear. Bookmark the permalink.